The advent of complex intelligent structures and low-voltage electronic installations within buildings requires increasingly sophisticated lightning protections techniques. 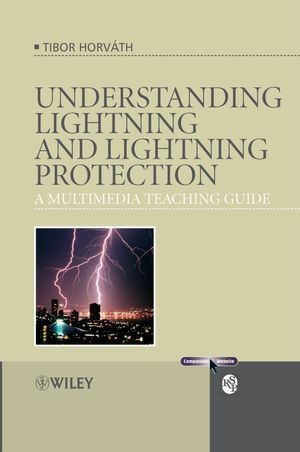 As a multimedia book, Understanding Lightning and Lightning Protection is a unique, interactive self-teaching tool that provides an in-depth understanding of lightning protection. Understanding Lightning and Lightning Protection helps the reader to understand the propagation of waves within complex intelligent structures within buildings, and the operation of systems designed to protect these structures. It also comments on proper human behaviour during a lightning thunderstorm. Shows the fundamental processes of the lightning phenomenon, and helps the reader to understand the measures of protection against lightning damage. Offers a new theory and calculation method to estimate the efficiency of lightning air termination systems, which helps to evaluate the residual risk of the lightning protection system. Examines the propogation of waves and the associated protection of intelligent systems against lightning electromagnetic impulses. This interactive teaching tool is designed for senior undergraduate and postgraduate students in electrical engineering, construction, physics and meteorology. It will also provide a valuable resource for practitioners within electric power distribution, electronics, informatics & construction safety. Tibor Horvath is a Professor Emeritus at the Budapest University of Technology and Economics. He has authored 17 books on high voltage engineering, insulations, static electricity, measurements and testing & the history of electrotechnics, and over 120 journal articles and conference papers. He has served as president of the International Conference on Lightning Protection, and has designed lightning protection systems for many prestigious buildings including the Hungarian Parliament and the cathedral of Budapest. Understanding Lightning and Lightning Protection Access the web-based animation programme to accompany the text.